Collaborate with any participants using any devices of their choice, from legacy H.323 endpoints to HTML5 web browsers, at any location. Offering a Native Experience on Skype for Business. Extend Your Lync Online / Skype for Business Online with Enterprise telephony and PSTN connectivity. 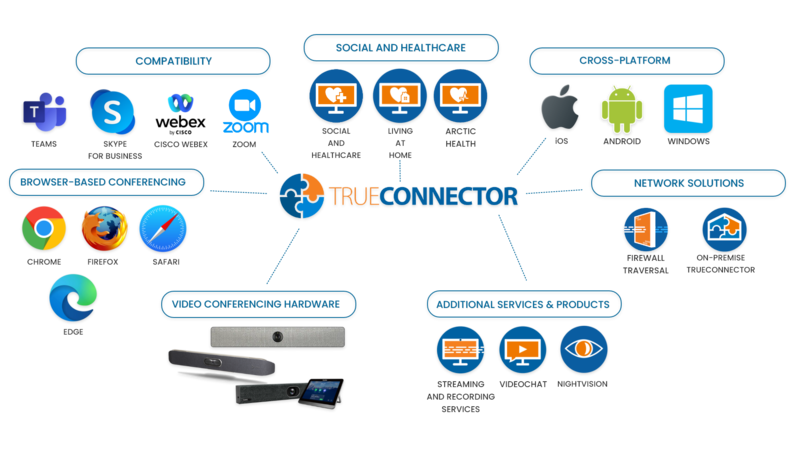 Trueconnector is the ubiquitous transcoder between Microsoft® Skype for Business™ (formerly known as Microsoft Lync) to virtually any enterprise videoconferencing endpoints. It enables all Skype for Business™ customers to interact with external parties through any open SIP or legacy H.323 videoconferencing endpoints, mobile devices, SIP phones, or computers with web browsers. Trueconnector supports numerous codecs such as H.263, H.263++, H.264, H.264 SVC (UCIF Profiles 0, 1), VP8, and RTVideo and call signaling protocols such as H.323, SIP, WebRTC, and Microsoft® Lync™, such that it can transcode between different codecs and translate between different protocols. To offer a seamless experience on both Skype for Business™ clients, Trueconnector automatically transcodes all of the industry content sharing standards, H.239 (for H.323), BFCP (for SIP), RDP (for Microsoft® Lync™/ Skype for Business™), and VP8 (for WebRTC), such that content can be presented and received across legacy and latest videoconference endpoints, mobile app, IP Phones, web browsers, as well as on Skype for Business™ / Lync™ clients. Our Cloud services guarantee around the clock access to services wherever you may be. Arctic Connect Ltd is an advanced Finnish video conferencing professional company. We are constantly seeking qualified professionals to join us in different areas bringing more knowledge and developing our business.